Scottish Cup action this Saturday as two of the youngest clubs in Scottish football lock horns at the Caledonian Stadium, Inverness. Ten year old East Kilbride from the Lowland Football League take on 25 year old (soon) Inverness Caledonian Thistle for a place in the last sixteen. 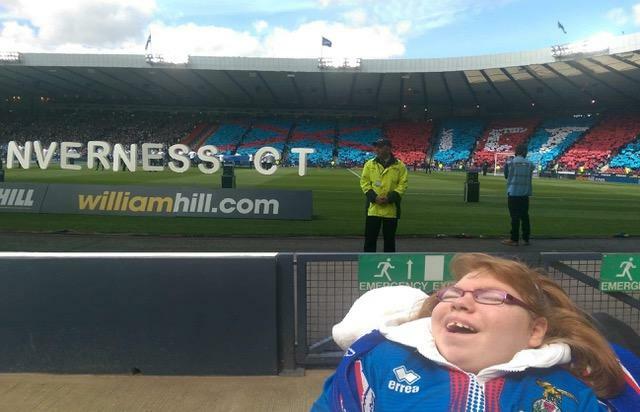 ICT has lost a great friend and supporter with the sad passing of Dawn Sinclair, who would have celebrated her 16th birthday on Saturday 19 January with a party at the stadium following the Scottish Cup tie against East Kilbride. A period of applause in the 16th minute on Saturday will be a fitting tribute to the teenager, who was a familiar face at games and at events run by Supporters, the most recent being a night out at Rollerbowl. She loved wearing her ICT strip and her proudest moment was being at Hampden in May 2015 to see the club lift the Scottish Cup. Tribute to Dawn on the Official ICTFC site. To the game on Saturday. The original club were formed in 1871 and folded a number of times in the early days. Their first recorded game was a 1-0 defeat by a Queens Park XI. The present club were formed in May 2010. Jackton Boys Club and Stewartfield F.C. were merged and later EK Diamonds and EK Wanderers were incorporated to form the club as we now know them. The team played in the Scottish Amateur Football League prior to being elected into the senior leagues in June 2013. They were elected to play in the newly formed Lowland League for season 2013/2014. They were granted full SFA membership in April 2014 and therefore could enter the Scottish Cup from season 2014–15. Their first Scottish Cup tie was a 1–0 first round win at Lothian Thistle. East Kilbride won the 2016–17 Lowland League, and progressed to a promotion/relegation playoff with Scottish League Two club Cowdenbeath. They missed out on promotion to the SPFL after losing a penalty shootout. Their big moment on the big stage came in February 2016 when they hosted Celtic in the Scottish Cup at Airdrie's Excelsior Stadium. It took goals from Scotland striker Leigh Griffiths and new signing Kazim-Richards to see off EK 2-0. A great effort from the Lowland League side. They warmed up for this tie with a 5-0 thrashing of Gretna 2008 and as the League table shows they are on course to top the table this season. There's a couple of guys we have definitely heard of. Ex Caley Thistle utility player David Proctor plays for them as does Chris Humphrey the former speedy Motherwell wide player. There's an interesting article in the Daily Record about Proc. Inverness have been without the injured George Oakley and Nathan Austin recently. Coll Donaldson has had groin surgery and will miss out, but our two suspended players, Brad Mckay and Shaun Rooney will return. Our last outing was a 1-0 victory over Ayr United last Saturday when a Jordan White goal secured all three points. You can see Jordan speaking ahead of this cup tie below. Let's do this for Dawn! CTO Sponsors FansBet have a wee opportunity for you to cash in as we're looking to start strongly against East Kilbride in the Scottish Cup. 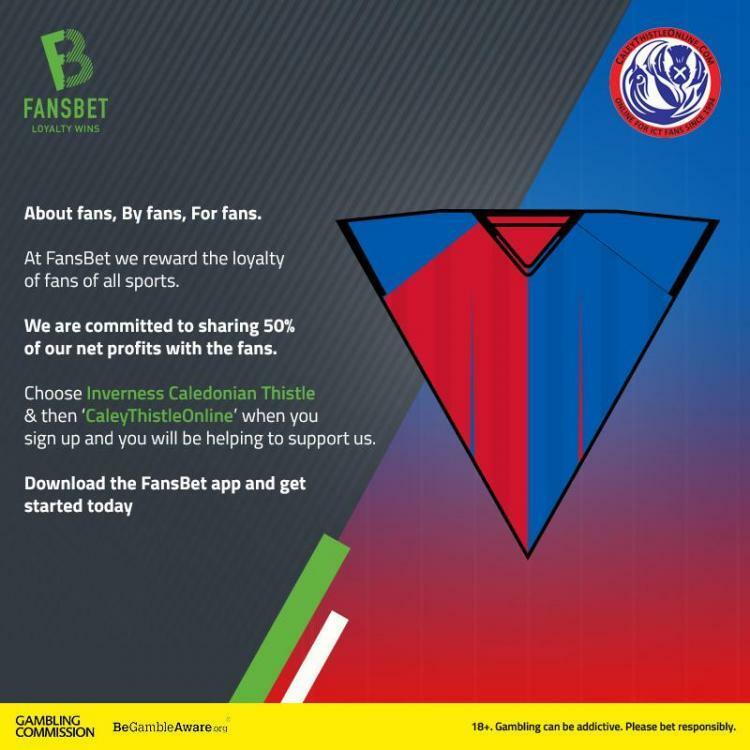 Sign up here http://bit.ly/2OBvlLv & select Caley Thistle Online to help us support the forum and ICT fan causes. 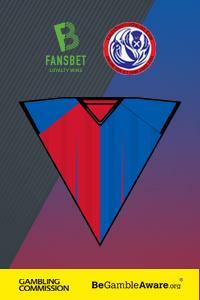 If you like a wee flutter, our new partnership with FansBet can offer you something. Just click on FansBet to get started. "Remember to select CaleyThistleOnline when you register and you’ll be helping us support ICT fan causes." Always remember to adopt safe gambling and responsible policies.